After reading “Two Cats and a Chicken Shop Mystery” make sure to come back and check out the secret Image Gallery and mysterious section on Bizarre Facts about the novel. Readers of the novel can enter these sections of the website with a password hidden in the book! These pages have a password for spoiler protection – you would not want to see them without having read the book!!! If you’ve “tasted blood” and are ready to solve your own mysteries, check back for More Mysteries. Become a fan on facebook and/or twitter to follow the news! Enjoy and thank you for downloading! 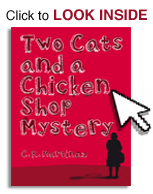 Tell your friends about Two Cats and a Chicken Shop Mystery.